“Nothing beats a great pair of legs!” I agree that a great pair of legs can do wonders for a physique. Do you know what else nothing beats- A great pair of shoulders!!! A pair of big broad shoulders can make any male look like an alpha amongst his counterparts. Nothing says power more than a pair of broad barn door shoulders. Broad shoulders even make a man seem to stand more upright and show a confidence that others don’t seem to show. Before we go too alpha male though, broad shoulders can also help turn “Plain Jane” into “Sultry Susan”. While shoulders are known for being a display of strength and power, on a woman a pair of well developed shoulders can be a display for confidence and sexuality. 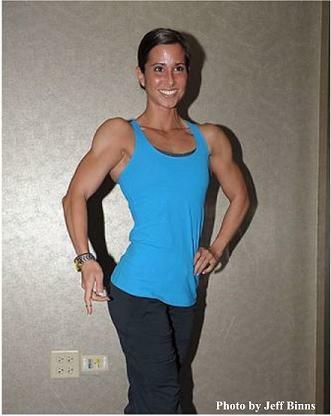 Next time you see a woman with well developed shoulders, take a good look at her. If you’re a guy I’m sure some of the first things you will notice are how “her girls” seem to stand more upright and command your attention. I know…I know… but ladies I’m giving you an honest male answer about one of the first things a male might notice. If you’re a female however, I bet two of the first things you notice is how great her waistline looks and how she just seems to walk with that “female power” confidence. The truth is any decent shoulder program will give you decent shoulder development. The problem with a lot of shoulder training programs is that they are just that…decent. Most of your basic shoulder programs involve some type of pressing movements, maybe an exercise to hit your side delts, and possibly an exercise for the rear delts. The problem with this type of shoulder workout is it is really missing out on the area of the shoulder that makes people take notice. Pressing movements are great if not the best type of exercise for overall shoulder mass development. As a matter of fact I think some form of pressing movement should be used in every person’s shoulder routine. The press allows for heavier weights to be used and causing more direct stress to the overall shoulder muscles. The problem with using a lot of pressing movements in your shoulder routines is, while developing good overall shoulder mass it places a heavier emphasis on the anterior deltoids. So while getting decent overall shoulder development, the front delts will be getting more work than the other delt heads. The question now is how do you get those shoulders that make you stand out from the rest? The secret to really outstanding shoulders is learning to break your shoulder training up into specific parts. By better isolating your shoulder training, you will get better results. 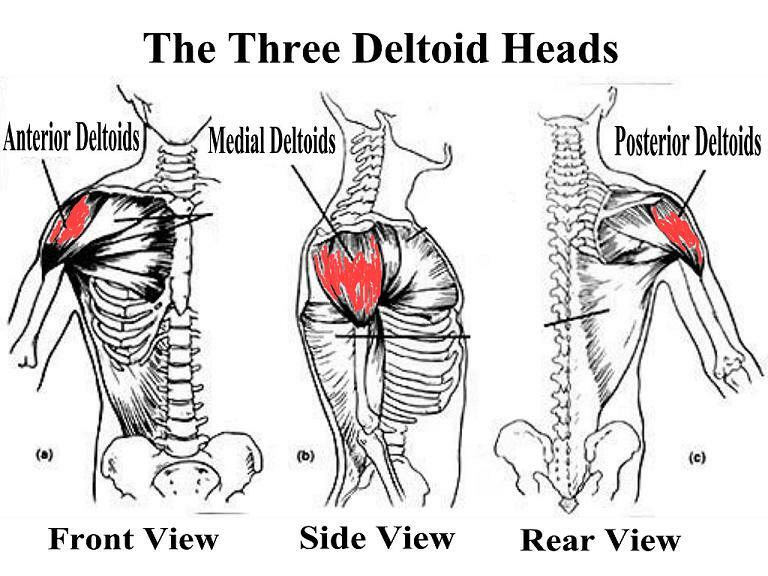 The deltoids are divided into three heads. They are the anterior head (front), medial head (side), and posterior head (rear). Not only does each head help play a different role in shoulder mobility but different levels of development will also give the shoulders different looks. The medial deltoids are the center of the three shoulder heads. The medial delts are made up of a group of muscle fibers in between the anterior delts and posterior delts. The functions of the medial deltoids are for shoulder abduction (moving the shoulder outwards from the body), flexion and transverse abduction (moving the shoulder in a straight line towards the center of the body). Most importantly for our purpose to achieve wider delts this is the area of the deltoids we want to concentrate on developing the most. The medial deltoids or side deltoids are the part of the deltoids that contributes the most to the visual appearance and size of shoulder width. If broadening your shoulders is the goal, you should be looking to target your side delts or medial heads. When not enough emphasis is placed on the medial head, the shoulders can still look big but don’t “stand out”. When it comes to increasing shoulder width, the medial head is the most important of all the deltoid heads. The more directly the medial head is targeted, the wider and rounder the shoulders will look. Now that we have distinguished which deltoid head we effectively want to target for more width in the shoulders, the question is how? What exercises can we use to get the most out of our medial delts? One of the main problems with medial delt training is the lack of ways to hit the medial delts. What exercises can we use to hit the medial delts? I’m sure if your like most you said use side lateral raisers or upright rows. Unfortunately probably one of the reasons most people said one of these two exercises is because honestly it might be the only side delt exercises they know. While these are two of the best exercises for hitting the medial delts, the problem occurs with execution. A lot of people just don’t know how to perform either of these to get the most out of their medial delts. Next we will look at both of these and how to perform them to really target the medial delts. We will also look at a couple more exercises that you may not be to familiar with that can help you get wider boulder shoulders. I feel the upright row can be one of the best exercises for side delt development when done correctly. Because it is a multi-joint exercise you can use more weight than other side delt exercises, placing more direct stress on the muscle. 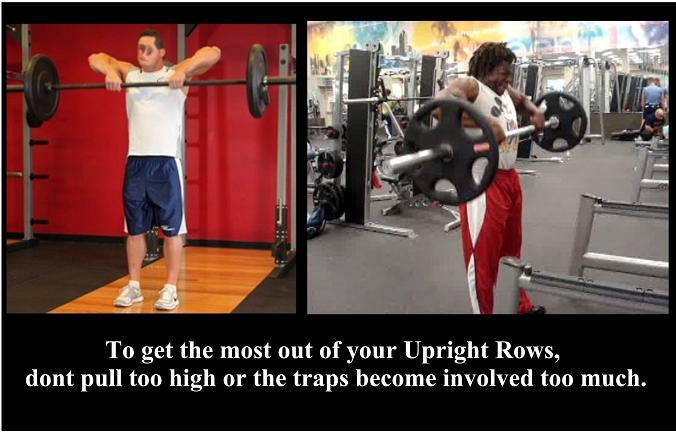 The upright row however, can be extremely problematic for some. When it comes to upright rows some people can do them virtually problem free, while others complain of everything from, wrist, elbow, shoulder, and especially rotator cuff pain. Some people even completely omit them from their training because they feel the risk vs. rewards is just not worth the effort. What if was to tell you of a way to do your upright rows, get the benefits they bring to the side delts, and virtually eliminate your aches and pains? So how do we fix the upright row to make it more user friendly and target the side delts better? First let us look at problem number one. One of the first thing people want to focus in on when changing the way they train their side delts is the amount of weight they use. I think one mistake people make when training side delts is they go about training them in a manner similar to front delts. Front delts respond well to lots of weight and sometimes loose form and momentum. To try and train the medial delts in this manner is not only non beneficial but dangerous on the shoulder joints. To get the most benefit out of side delt training focus on stricter form and lighter weights during your training. One thing to understand is you want to lift “lighter” but not light. You still want to work the side delts hard and heavy but by using weights that you can control under strict form. Less momentum and more feel for the actual muscle working. Next let us look at the second common problem with side delts when performing upright rows. When training side delts with upright rows, people tend to overextend their range of motion. This is usually the exact opposite of people and training other body parts. People usually don’t use a full range of motion when squatting or bench pressing but with the old upright rows it just is too much. The problem with too much range of motion on an upright row is it takes the stress off of the side delts and places it on the traps. Once the bar is pulled too high the traps begin to take over to assist in the pulling up of the bar. A second major problem is this position stresses the rotator cuff a lot but them in a position more susceptible to injury. When aiming to target the side delts, you should pull the bar no higher than the bottom of the chest. This will keep the majority of the stress directly on the side delts. Now let us look at the final most common problem with upright row execution. How you hold the bar will play a big role in how your side delts are hit during the exercise. The closer you hold the bar, the more your traps will come into play over your side delts. The closer you hold the bar the more stress you will also place on your wrist. Not only can this become problematic for the wrist joints but what some people don’t know is his can also lead to elbow joint problems also. To hit the side delts better, be sure to use a wider grip. 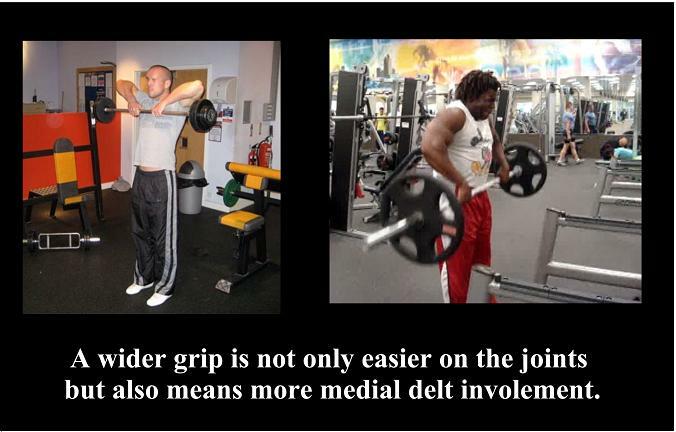 A wider grip will not only place more stress on the side delts but will also give you more control of the bar. Next you want to be sure when you are pulling the bar to be sure you have your arms down. On the standard upright row usually the arms are up parallel to the floor, we want the arms down for more effectiveness and less joint stress. By making these little tweaks to the traditional upright row, you can achieve more direct benefit for your side delts. The movement should sort of look like a hybrid of the upright row and the shrug. Think of it more like a wide grip bent arm shrug. So now that you have a new way of doing upright rows, what other exercises can you use with it to target your side delts a little better. Here are three more exercises that I think are great for really hitting the side delts. This is a great exercise for adding some real meat to the medial delts. The bent arm lateral raiser is performed very much like the lateral raiser except your arms are bent when doing them. This is a great exercise because you can go heavier than you would on a traditional lateral raiser with out sacrificing form. Because your arms are bent instead of straight, it creates a shorter line of leverage. When you have a shorter line of leverage you can move heavier weight without worrying about sacrificing form. The bent arm version also cuts out on unneeded stress that can be placed on the elbow and rotator cuff joints from trying to heave too heavy a weight. These also make a great free weight replacement for the lat raiser machine. Next time you go to use a lat raiser machine notice the position your arms travel thru when doing the movement. It is the same path if you were to do bent arm lat raisers. For anyone who does not believe these won’t work well for your medial delts give them a try for a few weeks. This is a great exercise for really pumping some blood into the medial delts. Because this is mainly a pressing motion, you will get some anterior delt work in here. To minimize the anterior delt work we start with our elbows parallel to the floor. The medial delts fire more when the arms are parallel to the ground, so by keeping the elbows up you get the benifit of more medial delt work. The execution on this one may take some practice but one you master it your medial delts will thank you. This is another great one for burning the medial delts. Grab yourself a set of moderate weight dumbbells. Be sure to grab a weight you can not only raise but hold in the air for a few seconds. · With your arms in this position, raise your arms up as high as you can. If having cannonball sized deltoids is your goal and you are having trouble getting them focus on building up your medial deltoids. Your medial deltoids or side delts will do the most to contributing to building up the appearance of really big wide shoulders. One of the problems with building the side delts happens to be a lack of exercise selection and the use of proper form to better target the side delts. By changing the way you perform some of your side delt exercises and adding a couple new ones in the mix cannonball sized delts are right around the corner.